If a reserved and well behaved dog is what you are seeking, then an Australian Terrier is one you will adore. They are full of character and very energetic. They will need steered away from any run ins with any rodents that may be living in the same household, or any unwanted ones crawling around as they love nothing more than going after them. This dog will need some form of stimulation, if it can be through exercise that is the preferred outlet of the Australian Terrier breed. They generally adapt well to situations with other canines in the same home and they are more aloof with strangers that may enter the home. Typically this type of terrier enjoys digging as most of the Australian breeds commonly do as well. The main ingredient to owning a happy Australian Terrier is to always give it time and open space to run and play. They thoroughly enjoy being active creatures and can withstand playing and even residing in just about any climate. They also enjoy playing and having daily interaction with their respective family members as they can be quite social dogs. They are easy dogs to care for and live inside a home without requiring too much maintenance. Born with a wire fur coat, they will need grooming attention from time to time on a weekly basis. This can help them keep excess debris from being trapped in their coats and also cleaning up any long hairs around their feet will need cared for as well. With no major health concerns noted by experts and vets, it is easy to notice why the Australian Terriers are such as lovable and popular breed. Some things that are minor and could be a possibility down the line are diabetes and some form of patellar luxation. In rare occurrences, the hounds have been noted to suffer from seizers, cruciate ligament ruptures and Legg-Perthes. They are one of the only breeds of canines that do not have a long list of required testing to screen for any additional health issues as they progress in age. Average life span of an Australian Terrier is from twelve to fourteen years long and they generally weigh twelve to fourteen pounds as full grown dogs. 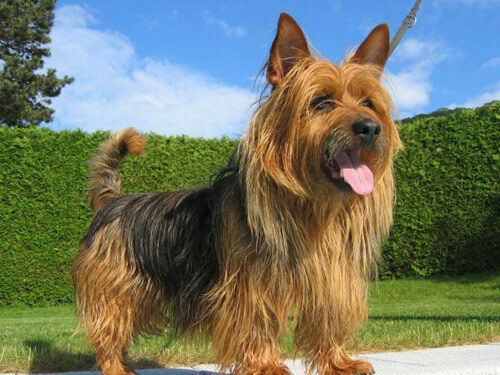 The Australian Terrier is considered the national breed, and it is also the tiniest one as well. Deriving from Tasmania, these hounds started off as your average furry companion and resulted in displaying their natural hunting abilities, giving them a boost in popularity in Australia. They can easily hunt small vermin of all types and have been around since the 1900’s. Currently, they are well known for being an Earthdog trail canine and received their nod from the AKC in 1960. They bode weatherproof coats and are born to be exceptional watchdogs by nature. Small in size, but fierce in their demeanor, these dogs are an Australian favorite for years to come.